We are excited to announce new options for crawling Facebook. We have added the ability to crawl profiles anonymously, crawl friends’ profiles, and crawl age and country restricted pages. Also, in an effort to make crawling Facebook easier we have combined page and profile crawl creation. We now offer the option to crawl a Facebook profile anonymously. This will allow you to capture a Facebook profile’s information that is available to all Facebook users. You can do this by simply entering the address of the profile you want crawled, then selecting the “Anonymous User” option for who to crawl as. Simply complete the form and we will begin crawling. If you need to capture more information than is available publicly, and are unable to get the user’s credentials, we have added an option for that also. You now have the ability to crawl friends and other profiles as they are available to you or anyone else who is willing to authorize the use of their credentials. This can be done by entering the address of the profile you want to crawl then selecting either the “Enter Facebook credentials” or “Email other Facebook User for credentials” options and proceed with authentication. We will then begin crawling the specified profile as if we were the user who authorized the crawl. Facebook fan pages can be restricted based on the age and country of the viewing user. 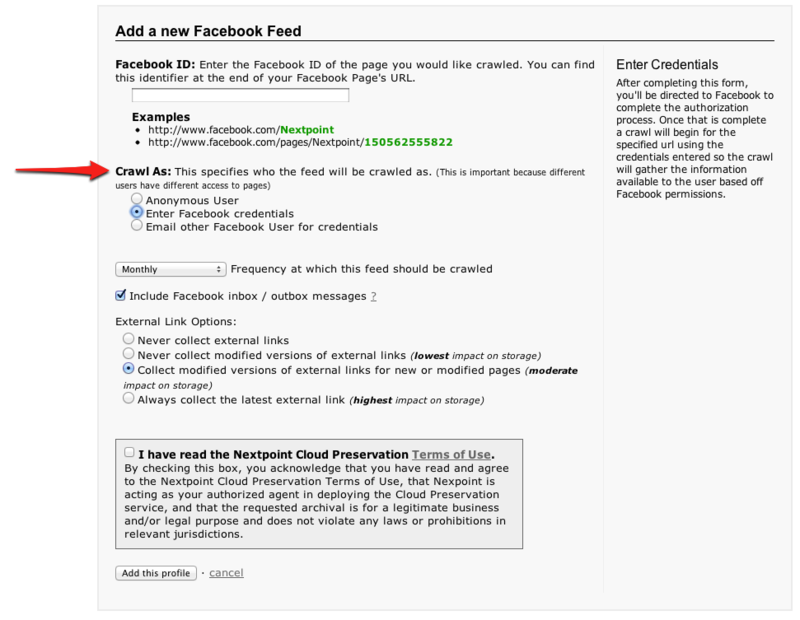 You can now crawl these restricted pages by selecting to crawl the feed with Facebook credentials that have the proper permissions to view these pages. When creating the feed, select either the “Enter Facebook credentials” or “Email other Facebook User for credentials” option and proceed with authentication. Once authentication is completed we will be able to crawl the page as if we were viewing the page as the authenticated user. In addition, you no longer need to know if you are crawling a Facebook fan page or a Facebook profile. You can create crawls for both using the same process. Simply select the “Facebook Feed” options from the “Add a New Website or Social Network Account” dropdown menu. From here you can simply enter the ID of the Facebook object you want to crawl, select who you want to crawl the object as (more on this later), then fill out the remained of the options just as before. After authorization, if it is required, we will start crawling Facebook. We hope the streamlining of the Facebook Feed setup will save you time when setting up new feeds. And we hope these new features will allow you to capture all the Facebook information you need. Nextpoint’s TrialCloud and DiscoveryCloud software now supports importing files directly from EnCase evidence files (E01) and Apple Disk Images (dmg) for all common disk formats — Windows XP, Windows 7, and Mac OS X. On the import screen, you’ll now find a Disk Image import type, enabled when a valid disk image file has been selected from your S3 folder. These may be single files or multiple split-image files contained in a zip. When this option is used, the uploaded hard drive will be extracted in place and the files it contains will be imported directly from the image as though they’d been opened and imported separately. At import time, a specific set of files and directories to import may be defined in order to narrow the scope of the uploaded data and avoid processing large amounts of uninteresting documents. Additionally, for disk formats that support it, you may choose to include or exclude system files (those bundled with the operating system itself rather than created by a user, potentially uninteresting during review) and hidden files (most often application preferences and filesystem metadata). These options, in combination with our DeNIST file filtering feature, allow you to focus in on the important documents from your collected evidence files quickly and easily. Document search results are normally displayed by one of two means: (1) Relevance – The document matches your search criteria, but how does it “score” compared to other documents that match? (2) Order that you explicitly specified. In many situations, this makes the most sense, but sometimes you want to view document families (i.e. email’s with their attachments) together. 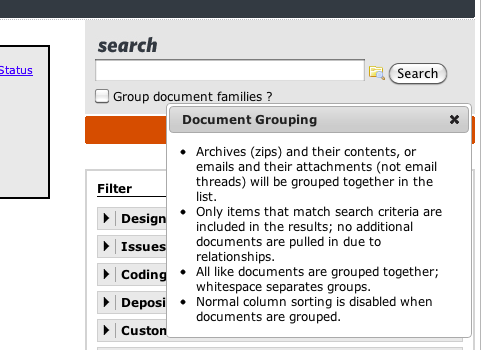 One way that we provide this capability is via “Group document families” (on the “Documents” page for TrialCloud; “Review” page for DiscoveryCloud). Selecting this option will group members of the same family together in the search results. Central to understanding the feature is an understanding of how Nextpoint defines a “document family”. While we believe that an email and it’s attachment are two separate but highly-related documents… we also believe that for features such as de-duplification it’s important to have knowledge of the context of an individual document. Therefore, a document’s “family” is considered to be anything that would typically be expected to be transmitted in a “single package”. For example, an email physically contains the bytes necessary to piece together an attached file — they’re “in a family”. A zip file contains the bytes necessary to re-assemble it’s contents: they’re in a family. A reply to an email does not contain all of the bytes necessary to recreate a true representation of the email it replies to: they’re not in a family. Are two identical documents considered to be “in a family”? Only if their entire family’s are identical. This most frequently happens when the same document is uploaded multiple-times by-itself , although it will also occur when the exact same email file (with an attached document) is uploaded more than once. Note: Each of these situations is blocked if deduplification is enabled. 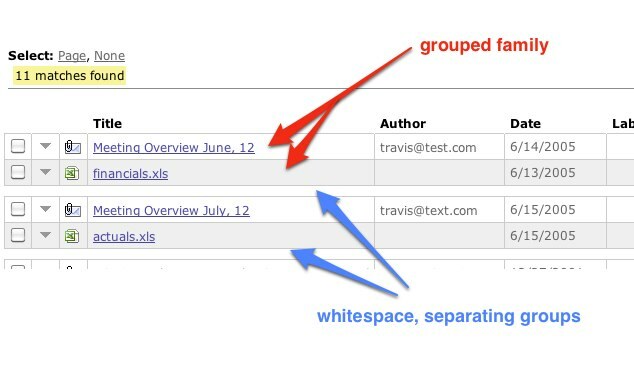 The results of the search display document families grouped together and separated by white space. In this example, 2 families are shown: each comprised of a single email and their single attachment. This feature does not pull any documents into your results that did not match your query, but instead does exactly what is promised: group the results of your search. For example, a hit in an attached Word document would not lead to the Email that attaches it being included in the set, unless the email itself also matched the search criteria. Should you require the capability to pull in related (non-matching) documents, options are available via “Bulk Actions” to accomplish that goal. Similar to any other sorting option with document search: The order documents are displayed on screen may be relied on to be the same order than any Bulk Actions (including Bates Assignment, etc) will be carried out.